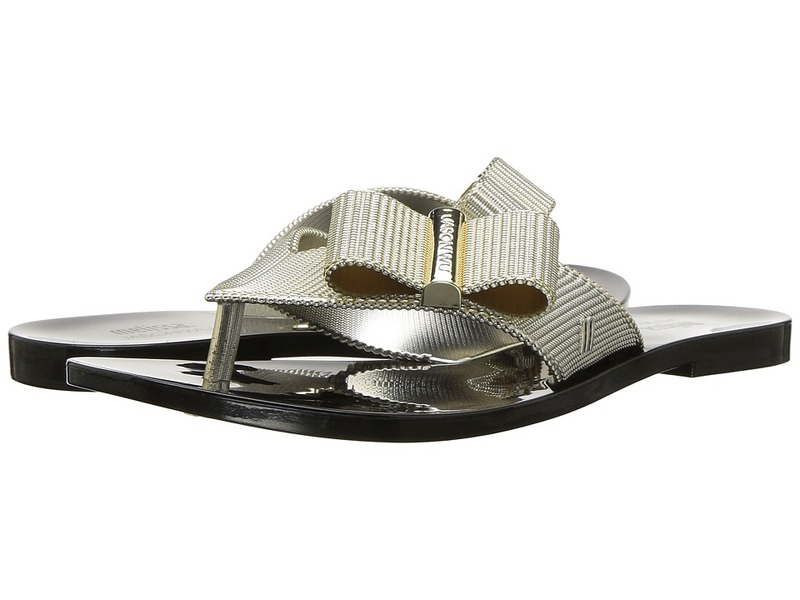 Decadently sweet is what you get wearing the + Melissa Luxury Shoes Jason Wu + Chrome Sandal. Man-made upper. Slip-on construction. Toe thong silhouette. Bow detail at toe with Jason Wu signature at hardware. Man-made lining and insole. Man-made outsole. Made in Brazil. This item may ship with an attached security tag. Merchandise returned without the original security tag attached or a damaged tag may not qualify for a refund. Measurements: Heel Height: 1 2 in Weight: 7 oz Product measurements were taken using size 7 UK (9 US), width B - Medium. Please note that measurements may vary by size. Weight of footwear is based on a single item, not a pair. Decadently sweet is what you get wearing the + Melissa Luxury Shoes Jason Wu + Melissa Chrome Sandal. Man-made chrome style upper. Slip-on construction. Toe thong silhouette. Bow detail at toe with Jason Wu signature at hardware. Man-made lining and insole. Man-made outsole. Made in Brazil. This item may ship with an attached security tag. Merchandise returned without the original security tag attached or a damaged tag may not qualify for a refund. Measurements: Heel Height: 1 2 in Weight: 7 oz Product measurements were taken using size 6 UK (8 US), width B - Medium. Please note that measurements may vary by size. Weight of footwear is based on a single item, not a pair. Obtain iconic beauty wearing the + Melissa Luxury Shoes Jason Wu + Melissa Espadrille. Man-made upper. Adjustable ankle strap with buckle closure. Round toe silhouette. Man-made lining and insole. Man-made low platform heel. Man-made outsole. Made in Brazil. This item may ship with an attached security tag. Merchandise returned without the original security tag attached or a damaged tag may not qualify for a refund. Measurements: Heel Height: 1 in Weight: 14 oz Platform Height: 3 4 in Product measurements were taken using size 6 UK (8 US), width B - Medium. Please note that measurements may vary by size. Weight of footwear is based on a single item, not a pair. 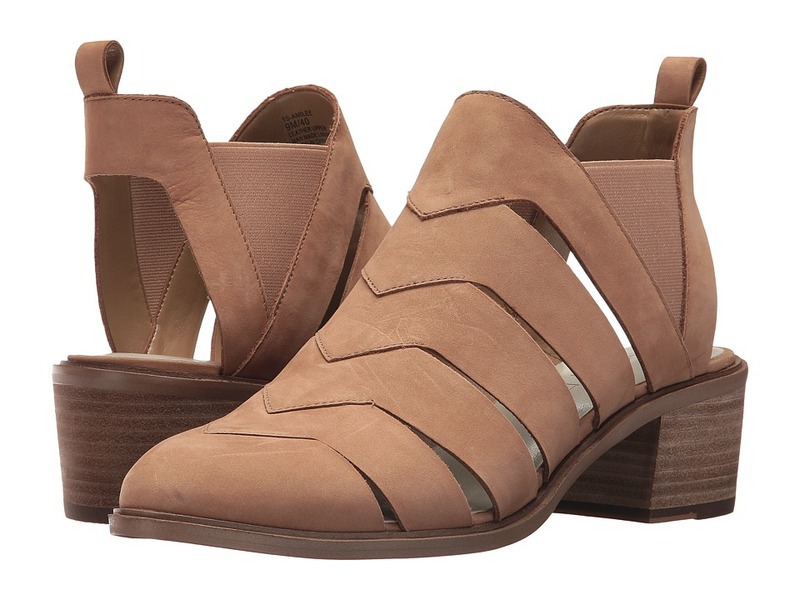 Fashion and function collide with the + Melissa Luxury Shoes Jason Wu + Melissa Jamie Sandal. Man-made upper. Adjustable slingback ankle strap. Open toe silhouette. Man-made lining and insole. Block heel. Man-made outsole. Made in Brazil. This item may ship with an attached security tag. Merchandise returned without the original security tag attached or a damaged tag may not qualify for a refund. Measurements: Heel Height: 2 1 2 in Weight: 14 oz Platform Height: 1 2 in Product measurements were taken using size 7 UK (9 US), width B - Medium. Please note that measurements may vary by size. Weight of footwear is based on a single item, not a pair. 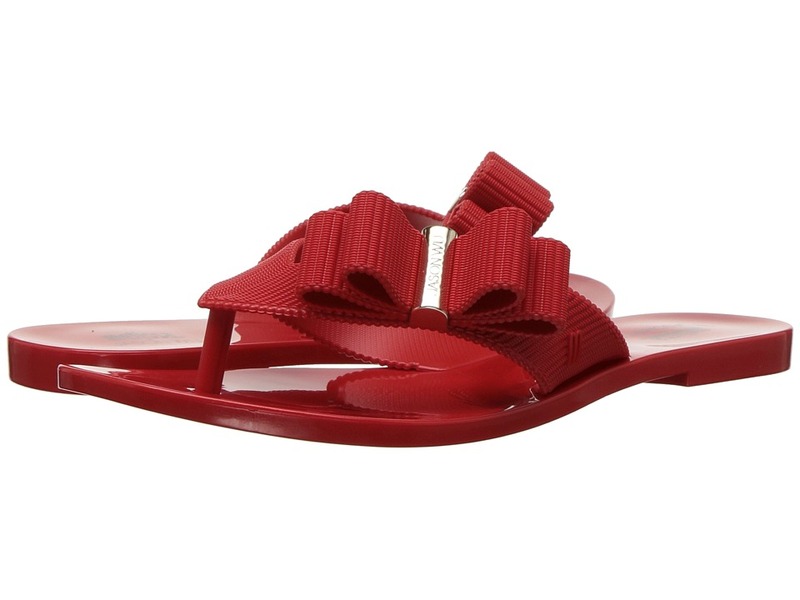 Surf, sand, and sun is all you need wearing the Vivienne Westwood Anglomania + Melissa Beach Slide. Synthetic upper. Slip-on construction. Open toe silhouette. Synthetic lining and insole. Synthetic outsole. Made in Brazil. This item may ship with an attached security tag. Merchandise returned without the original security tag attached or a damaged tag may not qualify for a refund. Measurements: Weight: 13 oz Product measurements were taken using size 5, width B - Medium. Please note that measurements may vary by size. Weight of footwear is based on a single item, not a pair. 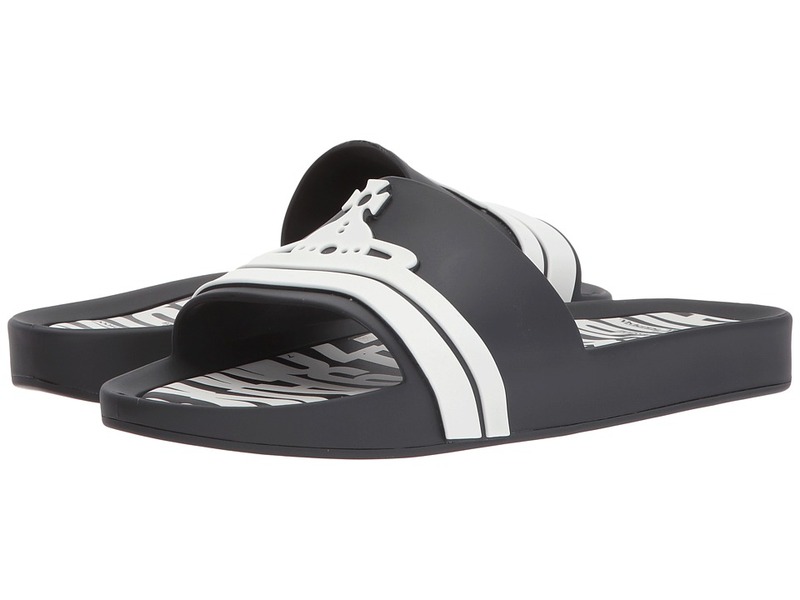 Surf, sand, and sun is all you need wearing the Vivienne Westwood Anglomania + Melissa Beach Slide. Synthetic upper. Slip-on construction. Open toe silhouette. Synthetic lining and insole. Synthetic outsole. Made in Brazil. This item may ship with an attached security tag. Merchandise returned without the original security tag attached or a damaged tag may not qualify for a refund. Measurements: Weight: 13 oz Product measurements were taken using size 9, width B - Medium. Please note that measurements may vary by size. Weight of footwear is based on a single item, not a pair. 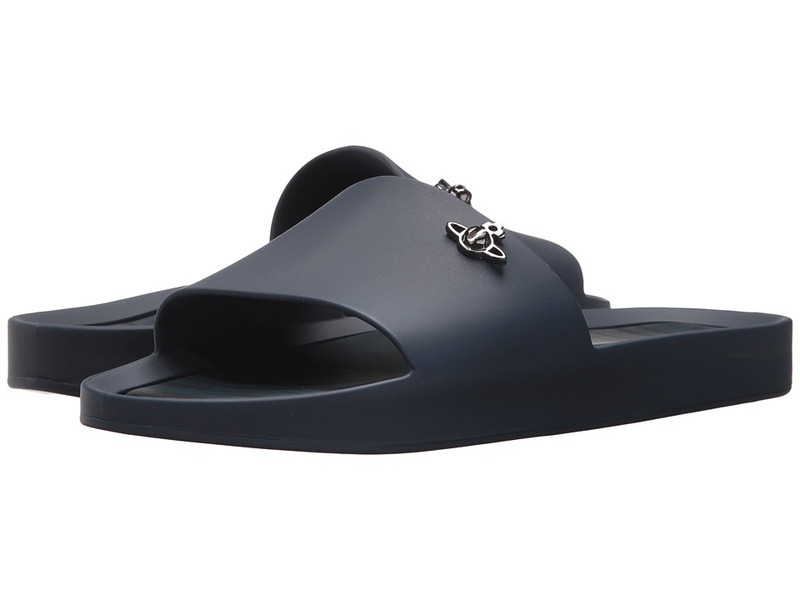 Surf, sand, and sun is all you need wearing the Vivienne Westwood Anglomania + Melissa Beach Slide. Man-made upper. Slip-on construction. Open toe silhouette. Man-made lining and insole. Heart and crown detail at toes. Synthetic outsole. Made in Brazil. This item may ship with an attached security tag. Merchandise returned without the original security tag attached or a damaged tag may not qualify for a refund. Measurements: Weight: 12 oz Product measurements were taken using size 6 UK (8 US), width B - Medium. Please note that measurements may vary by size. Weight of footwear is based on a single item, not a pair. 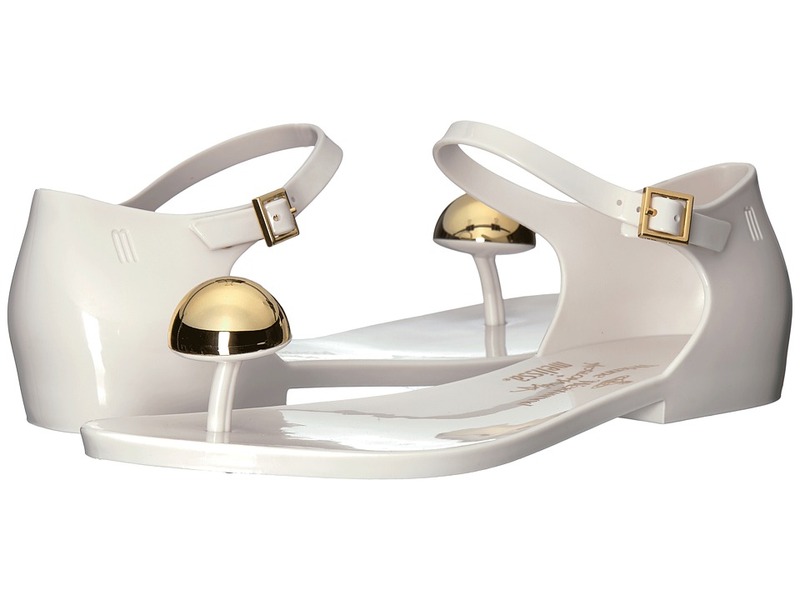 Your style shines through with the Anglomania + Melissa Honey Sandal by Vivienne Westwood. Durable man-made material upper. Slingback style strap with adjustable buckle closure. Slip-on design. Iconic orb emblem hardware piece attached to slender toe divider. Open-toe silhouette. Smooth man-made material lining. Lightly padded man-made material footbed. Low heel. Durable man-made material sole. Imported. This item may ship with an attached security tag. Merchandise returned without the original security tag attached or a damaged tag may not qualify for a refund. Measurements: Heel Height: 1 2 in Weight: 8 oz Product measurements were taken using size 8, width B - Medium. Please note that measurements may vary by size. Weight of footwear is based on a single item, not a pair. Step royally when wearing the Vivienne Westwood Anglomania + Melissa Lady Dragon XIV Heel. Shining synthetic upper. 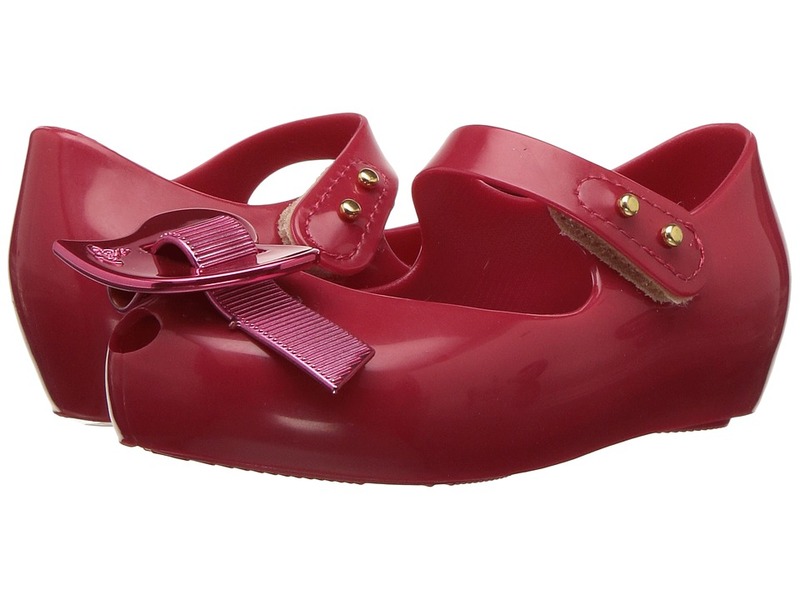 Slingback style adjustable strap with gold-tone snap buttons for secure closure. Slip-on construction. Peep-toe silhouette. Large orb detail at toe. Synthetic lining. Lightly padded insole with embossed brand name logo. Wrapped high heel. Durable synthetic outsole. Made in Brazil. This item may ship with an attached security tag. Merchandise returned without the original security tag attached or a damaged tag may not qualify for a refund. Measurements: Heel Height: 3 in Weight: 13 oz Platform Height: 1 2 in Product measurements were taken using size 9, width B - Medium. Please note that measurements may vary by size. Weight of footwear is based on a single item, not a pair. 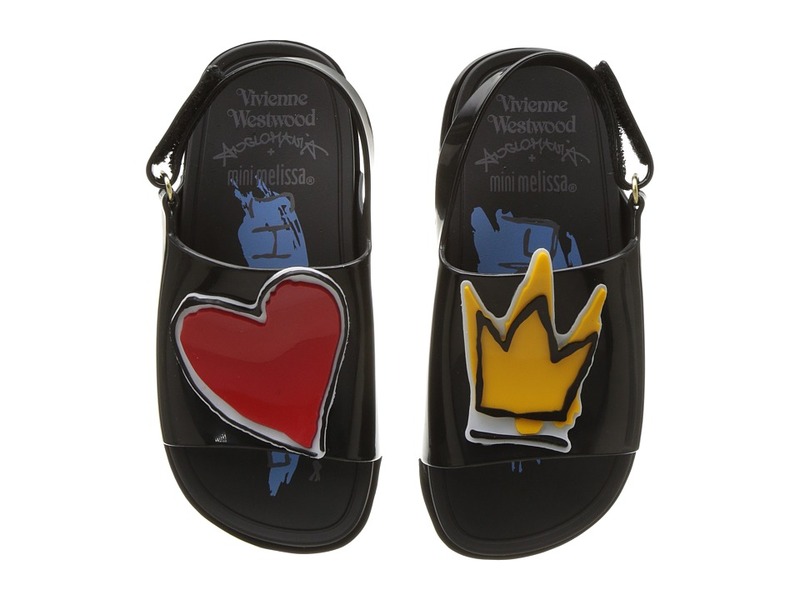 Step royally when wearing the Vivienne Westwood Anglomania + Melissa Lady Dragon XV. Shining man-made upper. Slingback style adjustable strap with gold-tone snap buttons for secure closure. Slip-on construction. Peep-toe silhouette. Iconic orb emblem with safety pin features at toe. Man-made lining. Lightly padded insole with embossed brand name logo. Wrapped high heel. Durable man-made outsole. Made in Brazil. This item may ship with an attached security tag. Merchandise returned without the original security tag attached or a damaged tag may not qualify for a refund. Measurements: Heel Height: 3 3 4 in Weight: 12 oz Product measurements were taken using size 9, width B - Medium. Please note that measurements may vary by size. Weight of footwear is based on a single item, not a pair. You can never go wrong with the classically chic look of the Vivienne Westwood Anglomania + Melissa Space Love III. Man-made upper. Slip-on construction. Round toe silhouette. Asymmetrical heart at toe. Man-made lining and insole. Man-made outsole. Imported. This item may ship with an attached security tag. Merchandise returned without the original security tag attached or a damaged tag may not qualify for a refund. Measurements: Heel Height: 1 2 in Weight: 7 oz Product measurements were taken using size 6 UK (8 US), width B - Medium. Please note that measurements may vary by size. Weight of footwear is based on a single item, not a pair. Step royally when wearing the Vivienne Westwood Anglomania + Melissa Ultra Girl XIX. Synthetic upper. Slip-on construction. Peep-toe silhouette decorated with faux pearl and safety pin accent. Iconic orb emblem at toe. Synthetic lining. Lightly padded insole. Synthetic outsole. Made in Brazil. This item may ship with an attached security tag. Merchandise returned without the original security tag attached or a damaged tag may not qualify for a refund. Measurements: Heel Height: 1 in Weight: 9 oz Product measurements were taken using size 8, width B - Medium. Please note that measurements may vary by size. Weight of footwear is based on a single item, not a pair. Step royally when wearing the Vivienne Westwood Anglomania + Melissa Ultra Girl XVIII. Synthetic upper. Slip-on construction. Peep-toe silhouette decorated with cylindrical accent. Iconic orb emblem at each side. Synthetic lining. Lightly padded insole. Synthetic outsole. Made in Brazil. This item may ship with an attached security tag. Merchandise returned without the original security tag attached or a damaged tag may not qualify for a refund. Measurements: Heel Height: 1 in Weight: 10 oz Platform Height: 1 4 in Product measurements were taken using size 9, width M. Please note that measurements may vary by size. Weight of footwear is based on a single item, not a pair. Surf, sand, and sun is all you need wearing the Vivienne Westwood Anglomania + Melissa Beach Slide Sandals. Synthetic upper with heart and crown accent. Slip-on construction. Hook-and-loop ankle strap for a secure fit. Open-toe silhouette. Synthetic lining and insole. Heart and crown detail at toes. Synthetic outsole. Made in Brazil. This item may ship with an attached security tag. Merchandise returned without the original security tag attached or a damaged tag may not qualify for a refund. Measurements: Weight: 5 oz Product measurements were taken using size 7 Toddler, width M. Please note that measurements may vary by size. Weight of footwear is based on a single item, not a pair. 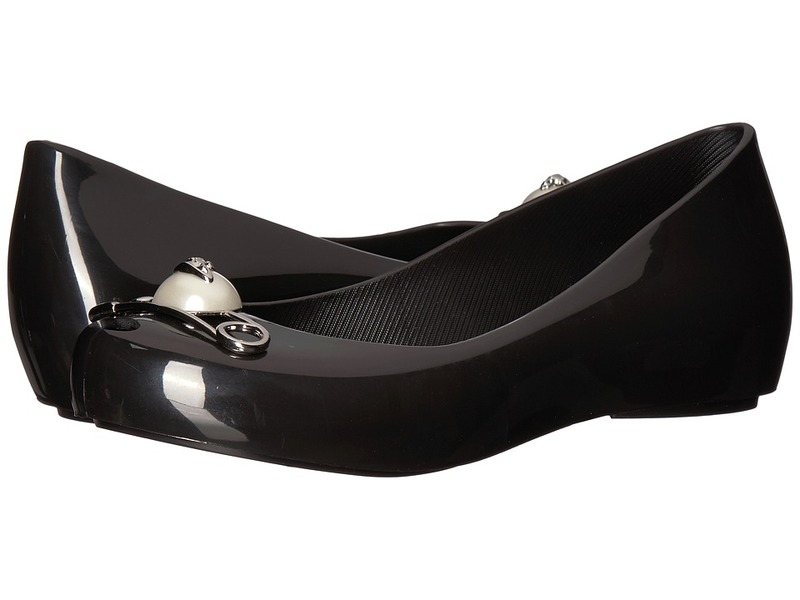 Step royally when wearing the Vivienne Westwood Anglomania + Melissa Mini Anglomania + Melissa Ultragirl XI flats. Synthetic upper. Strap across the vamp with hook-and-loop closure. Peep-toe silhouette. Large orb with grosgrain ribbon at the toe. Synthetic lining. Lightly padded insole with embossed brand name logo. Durable synthetic outsole. Made in Brazil. This item may ship with an attached security tag. Merchandise returned without the original security tag attached or a damaged tag may not qualify for a refund. Measurements: Weight: 4 oz Product measurements were taken using size 8 Toddler, width M. Please note that measurements may vary by size. Weight of footwear is based on a single item, not a pair. Give yourself a refreshed and refined look in this 1. STATE blouse. Lightweight sweater fabrication complements the relaxed silhouette. Mock neckline. 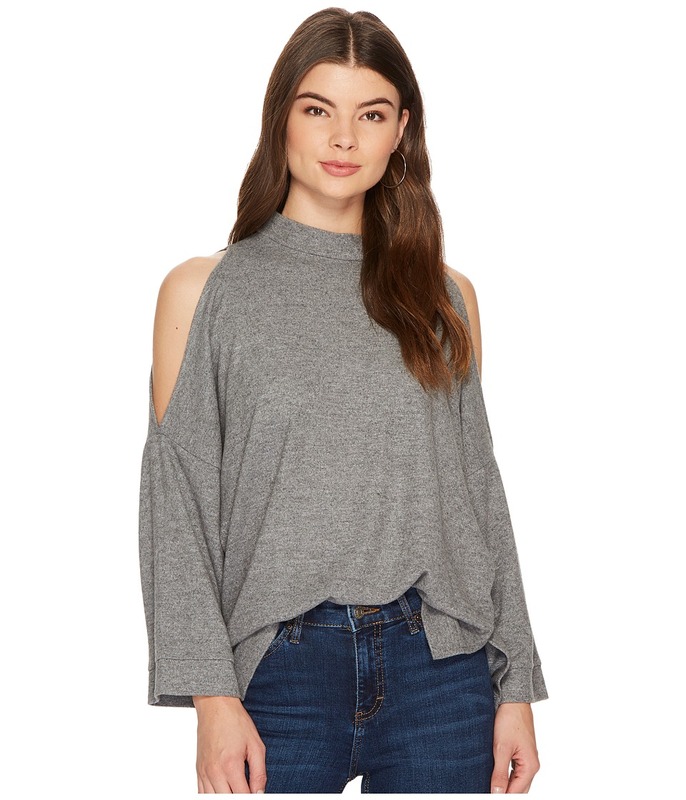 Boxy long sleeves with cold-shoulder detail. Straight hemline. 73 percent polyester, 24 percent rayon, 3 percent spandex. Machine wash and line dry. Imported. Measurements: Length: 26 in Product measurements were taken using size SM. Please note that measurements may vary by size. Elevate your look with these 1.STATE Aisha heeled sandals. 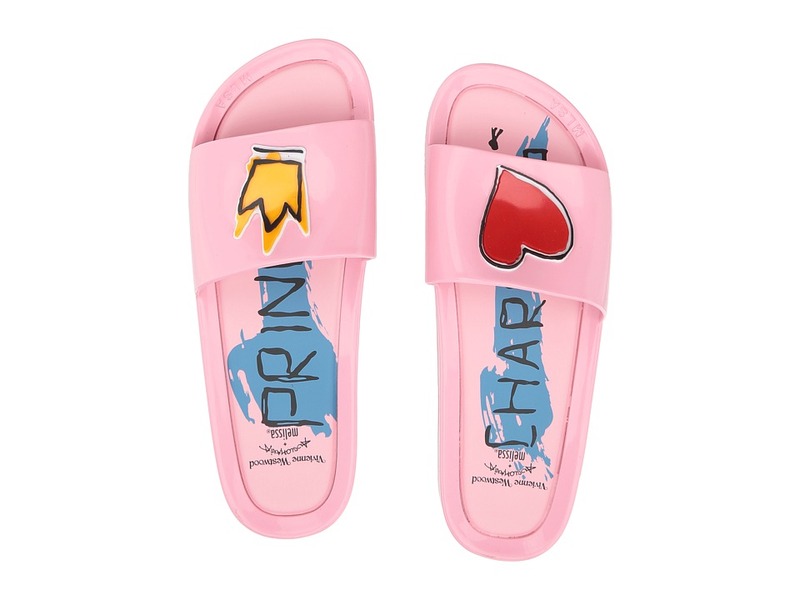 Slides made with leather upper. Twisted strap design. Easy slip-on wear. Open-toe silhouette. Leather lining. Lightly-padded, fixed footbed. Wooden heel. Synthetic outsole. Imported. Measurements: Heel Height: 3 1 4 in Weight: 8 oz Product measurements were taken using size 9, width M. Please note that measurements may vary by size. Weight of footwear is based on a single item, not a pair. Keep your style fresh and classic with the 1.STATE Amilee ankle boot. Rich nubuck leather upper. Pull-on with elastic goring for a comfortable fit. Caged silhouette. Rounded toe and exposed heel. Man-made lining. Soft, lightly padded footbed. Stacked block heel. Man-made sole. Imported. Measurements: Heel Height: 2 in Weight: 12 oz Circumference: 9 1 4 in Shaft: 4 in Product measurements were taken using size 9, width M. Please note that measurements may vary by size. Weight of footwear is based on a single item, not a pair.